Let’s bounce around the country and try to forecast what's ahead in Week 1. The Pac-12 didn’t send a team to the College Football Playoff last season, and Washington is its best chance to change that in 2019. The Huskies are deep, hungry, and have a good and experienced quarterback in Jake Browning. The Tigers return Jarrett Stidham under center, but the offensive line is almost entirely new. Kerryon Johnson is also off to the NFL. This could ultimately turn into a battle of defensive line vs. offensive line; both teams have plenty of talent on the outside. Perhaps the swing factor here: Auburn is close to home playing in Atlanta, while Washington has to travel across the country. That didn’t go well for the Huskies when they did so two years ago against Alabama in the College Football Playoff. But Browning was a freshman then, and Washington has more proven talent than Auburn. It’s daunting to pick a Pac-12 team over an SEC team based on what we saw last season, but it’s a new year. It was a tough regular and offseason for Tennessee in 2017, going winless in the SEC and trudging through one of the most bizarre coaching searches in recent memory. But the Volunteers found their man in Nick Saban disciple Jeremy Pruitt, and though Tennessee hasn’t won much recently, there’s talent on the roster. But West Virginia is a sneaky Big 12 title contender. Will Grier was a stud in 2017, throwing for 3,490 yards and 34 touchdowns. David Sills, who caught 18 touchdowns last year, is also back. Tennessee is probably outmatched here, but it’ll be interesting to see how the Volunteers look under a new head coach. Will the penalties go away? Will the mental errors diminish? Tennessee has a high range of outcomes in 2018, and while moral victories are usually hollow, the Week 1 final score may not be the most important thing for the future of the program. It’s about a culture shift. Brian Kelly announced that Brandon Wimbush would start vs. Michigan, but Kelly had Wimbush on a short leash most of 2017. Wimbush is an outstanding runner but an inconsistent thrower, though he was better than backup Ian Book last year. And the Michigan defense, led by Rashan Gary, figures to be one of the best in the country. Notre Dame got off to such a hot start last year mostly thanks to its offensive line, but Mike McGlinchey and Quenton Nelson are gone. The Fighting Irish have talented guys taking those spots but are unlikely to have the superior protection they did a year ago. Michigan presents an extremely tough test. The Wolverines’ offense is unproven too, but Shea Patterson was solid at Ole Miss last year and Michigan has a deep stable of running backs. Tarik Black’s injury stings, and the Wolverines are on the road. But taking a look at both depth charts, one just seems to pop more than the other. This probably won’t be much of a fight, but there’s still plenty to watch for. It’s Louisville’s first game post-Lamar Jackson, and the Cardinals’ roster is decent for the ACC. But it’s no match for Alabama. The Crimson Tide present the most fascinating quarterback situation in college football, and Saban still hasn’t announced a starter as of this writing. Will he go with Jalen Hurts, a proven winner who has helped guide Alabama to two straight College Football Playoffs? Or will he go with Tua Tagovailoa, the guy with the bigger arm and the higher ceiling who saved the Tide in last year’s national championship game? 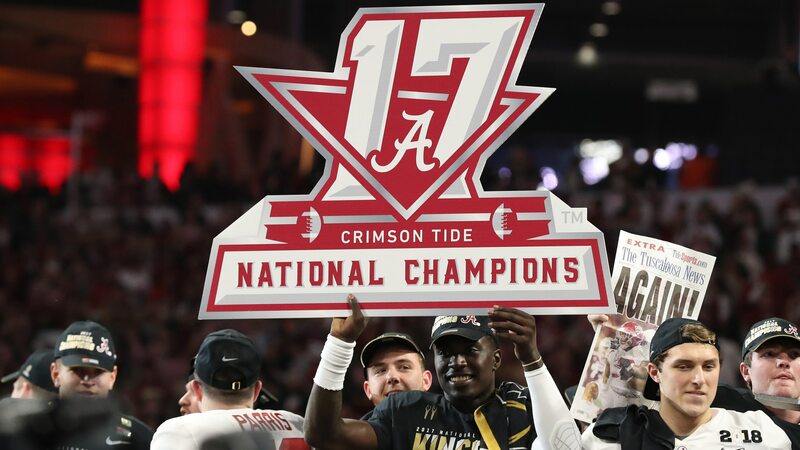 Alabama should roll, but it will be interesting A) to see who Saban starts, and B) if that quarterback is affected by the immense drama surrounding the situation all offseason.